In January 2001, Stewart Copleand performed a special concert at the NAMM show in Anaheim, CA. It was in a huge ballroom of the Anaheim Geek Hilton. He and his orchestra played songs from his film scores, and also his operas. I was in the front row with a few of my drummer friends (Josh Freese, Dean Butterworth, and Drew Hester), and we were all like little kids gawking at one of the greatest drummers alive. Stewart was animated, aggressive, and everything else you would expect from him. It was inspiring to see him play again, and especially sitting so close! After the show, my wife and I were walking around the place, and lo and behold, here comes Stewart Copeland and his entourage walking towards us. Melinda elbows me and HAt says something like “look, there’s Stewart, now’s your chance to say something”, but I was totally choked up and he passed right by. There went my one chance to meet the drummer who inspired them? me to pick up a pair of drum sticks and start playing. I suppose some people would call this being star struck, but I’ve met some other famous people including Brian Eno, Peter Gabriel, Daniel Lanois, and this never happened before. About and hour later, we’re still in the hotel (NAMM shows are all about running into people), and sure enough, I see Stewart again, up ahead, this time walking away from us. Well, I had a few drinks by then, so I had the nerve to say something. I went running up to him, and yelled “Hey Stewart!” (as if we were on a first name basis!). He turned around, and I said something like ‘It was great to see you play tonight, Rod and I’ve always enjoyed your playing.” Or something to that effect. He smiled, said thanks, and we shook hands. So there it was, it finally happened. 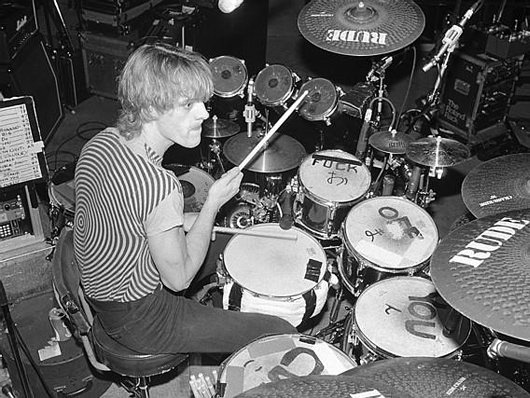 If you had told me back when I was a kid that I would one day meet Stewart Copeland, and I told said you were crazy.